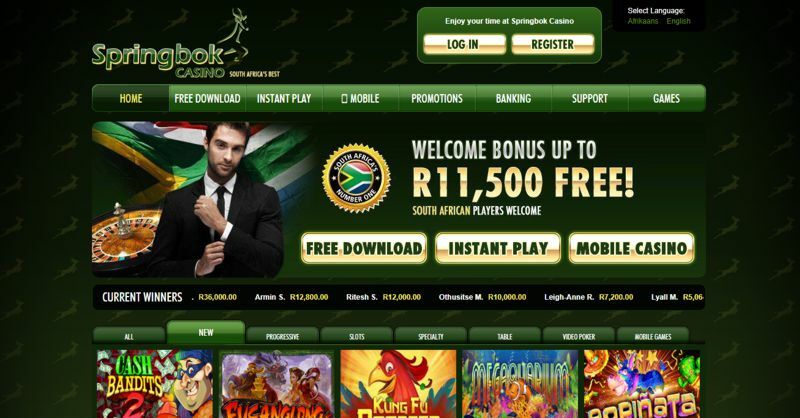 Springbok Casino is just one of many online casinos available in the world, but what sets it apart is its South African theme and customer service. This online casino was set up for South African players to be one of the best South Africa casinos available online. It offers a range of games in a variety of forms, including download, instant play, and mobile. & up to R11,500 in Bonuses. Free R250 Bonus – Coupon Code: TEST-SPRINGBOK. 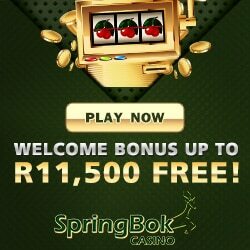 All new players at Springbok Casino qualify for a free R250 No Deposit Required Bonus. Simply create an account, visit the cashier, click on the Coupon tab and enter the following coupon code: TEST-SPRINGBOK. Your new account will be credited with R250 instantly. Wagering requirements are 60 x bonus (R15,000) with a maximum cash out R500. Valid only once per new player, per household. Claim up to 3 First Deposit Sign up Bonuses up to R11,500. 1st. Deposit – 100% up to R1,500 – Coupon Code SPRINGBOK100. 2nd. & 3rd. Deposits – 50 % up to R5,000 – Coupon Code SPRINGBOK50. Wagering requirements for deposit bonus coupons are 30 times the sum of the deposit plus the bonus, unless otherwise stated. Springbok offers over 100 games including slots like Aztecs Millions and other progressive jackpots. If you are curious to know if the casino pays out, there is a list of winners that consistently scrolls on the pages of the casino. This enables you to see who is winning and how much they are up. Springbok Casino uses Real Time Gaming (RTG) games. The casino provides you with a preview version of slots, roulette, video poker, craps, baccarat, and blackjack. With free play options you have a chance to learn about the game and how it is played before you bet real money. Springbok Casino offer a wide variety of banking options to transfer funds to and from your player account. Springbok Casino promises to offer top security for your account. They state in the terms of conditions that they provide the best effort possible to ensure you have full protection when you play here, but unforeseen events are out of their control. They do state that all online activity is tracked in the event you lose your connection, casino staff can determine the game you were playing, your earnings, and make certain the interruption does not hinder your game play. In this way they can track winnings and losses in real money mode. In the 90s and early 2000s slot tournaments were a huge deal, but many casinos no longer offer these options. At Springbok you can find slot tournaments on a daily basis. There are specific rules such as buying in with your cash. Bonuses you obtain through promotions cannot be used to buy-in the tournaments. There are also free roll tournaments that you can gain eligibility for. Springbok makes it possible to talk with customer service agents through a variety of methods including email. You can also dial their toll free number and connect via social media if you have questions. 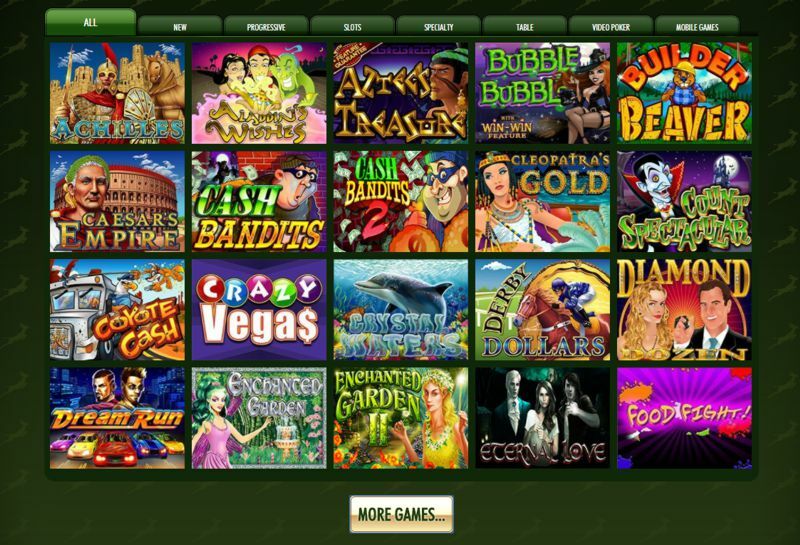 Plenty of top games from RTG are available for players, particularly the progressive jackpots that the software company is known for. There are also a variety of bonuses and promotions that make the casino worth a look. They currently have R11,500, with a three tiered deposit welcome bonus available that will delight players. The only drawback is the lack of transparency regarding their license and regulatory agency. This gives one pause since most casinos are proud to display this information if they are a legitimate place to play.